As I write this blog post, there is a beautiful fresh coat of snow on the ground. Winter has officially arrived, albeit a little early. We also got a little ice as an “added bonus.” More is in the forecast for today, but most of our schools are sticking to their regular schedules. That means many school buses will likely be navigating some tricky road conditions as they bring children home this afternoon. Bus drivers may face additional challenges on the streets that haven’t been plowed or salted, and with a bus full of rowdy children who just want to get home and play outside, I don’t envy them. This time of year, it’s par for the course, or should I say, road. School buses have to make their way through snow and ice. We’ve all seen the news reports where one or more of them in our districts have slid off or been in an accident. Sometimes they even overturn when a tire leaves the road and suddenly the driver finds the bus tipping into a ditch the snow obscured a half second before. At SafeGuard®, we always want children to have the added protection seat belts on the school bus can bring, but in the winter time, imagine the difference they could make. Bus drivers can better focus on slippery roads. Students would be seated properly rather than in positions that could increase their chances of being injured. SafeGuard recently conducted two separate events to demonstrate what happens in a frontal crash when students are out of position. The results were alarming. Compartmentalization is intended to save their lives, but in an accident, the results can still lead to concussions and spinal cord injuries when the children are slammed into the seats and other students. Watch what happened at SafeGuard’s most recent crash test event. The out of position “students” did not fare well, while those in seat belts were considerably more protected. The bus was only going 30mph, and this was a frontal crash, the kind of crash where compartmentalization is supposed to work best. Now imagine how badly it could fail when a bus slides off an icy road and rolls over. Driving a bus is a tough job made more difficult by snow and ice. When I hear people say that compartmentalization is safe enough, I wonder if they would still agree after experiencing crashes like these first hand. I’m sure for the parents whose children suffer bloody noses, concussions and even worse from the very system designed to protect them might agree that “good enough” is not enough. Not when their children could have potentially been spared such injuries had then been wearing seat belts. If you think seat belts should be on school buses, fill out the advocate request form for more information! For years, SafeGuard has heard excuse after excuse against using lap-shoulder belts on school buses, but there is one in particular we hear from parents. They fear a scenario where seat belts could slow or prevent their child from evacuating in a serious accident. The reality is that without seat belts on your child’s school bus, children might not be able to evacuate at all. When a school bus rolls over and children aren’t belted in, they are far more likely to suffer serious injuries or to be knocked unconscious, making evacuation more difficult if not impossible without the help of others. The videos below show what happens to unbelted children in a rollover. They are tossed about, slamming into everything from the ceiling to other children, dramatically increasing their risk of injury. The children who are belted in remain safely and securely in their seats. The seat belts SafeGuard puts on school buses are no different than the ones in your car. Children learn from an early age how to buckle and unbuckle their seat belts, and in the event of an accident on the school bus, it takes a child a second or less to push the button and release himself. By Federal Safety Standards, the force required to push the release button is the same as what your child experiences in your vehicle, even when the belt is under a load such as that caused by the weight of a passenger in a rollover. What can slow down evacuations is the limit of one person at a time through the rear emergency exit and/or the front door. The use of the side exit windows and roof hatches are an extreme rarity in evacuations, and are even much slower. Lap-shoulder belts help speed up the evacuation process. It is far easier for a conscious, uninjured child to escape. Just like drills inside the school building, the same kind of emergency preparation should be conducted for students who ride the bus, so children know what to do and where to go in the event of an accident. Being prepared, whether they have seat belts or not, helps keep them calmer and also helps them to evacuate more quickly. Lap-shoulder belts also help protect your children in other types of crashes as well as sudden stops. When children aren’t wearing lap-shoulder belts on the school bus, a sudden stop propels them into the seat in front of them, often causing minor injuries. When they’re belted in, this doesn’t happen. It’s time to move past the misinformation that’s been circulating for decades about lap-shoulder belts on school buses. The fact is there is absolutely no proof that seat belts slow the evacuation process. What has been proven is that seat belts can save lives. No More Excuses – It’s Time for Seat Belts on School Buses. There are No More Excuses® — it’s time for seat belts on school buses. 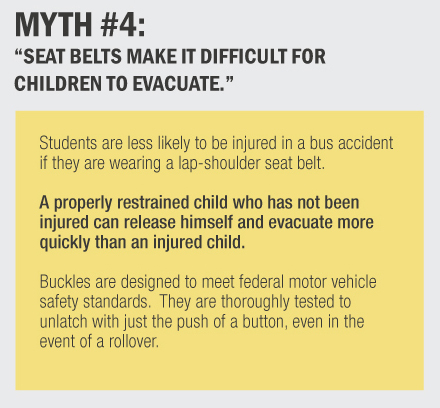 With this inforgraphic below, you’ll find out the new statistics and innovations around school buses seat belts as well as the most common misconceptions on the bottom half of the graphic. Want more information on School Bus Safety? Click here & here for articles we’ve written on the topic. Want to start a movement in your community for seat belts on school buses? Join us on Facebook, and click here for more advocate resources. Download the hi-res version here, and share it with your friends! The question has been asked time and time again – why aren’t there seat belts on school buses? With the recent school bus rollover in Illinois, this question is fresh on everyone’s mind. Did you know that SafeGuard lap-shoulder belts increase safety and also decrease bad behavior? 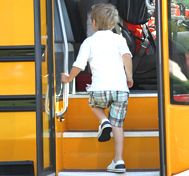 It’s a win-win situation for everyone – the parents, the students, and the bus drivers. According to this article from the Chicago Tribune, school bus seat belts are a tough sell. Why is that? Opponents of seat belts on school bus will list several myths that are either (1) outdated or (2) just plain wrong. What are these common myths? Check them out in our infographic below, or click here for a list. Why is it Time for Seat Belts on School Buses? 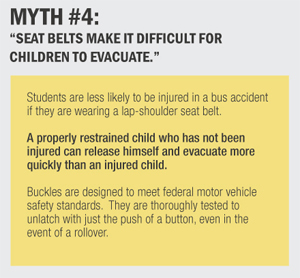 Get the hard facts, statistics, and nationwide history of seat belts on school buses in our infographic below. Share this with your friends, and start the community movement to get seat belts on your district’s school buses TODAY. Click here to view the full-size version. Compartmentalization, developed in the 1960s, requires closely spaced, energy absorbing, high-back padded seats. In a frontal crash, children impact the seat in front of them, and that seat absorbs their energy. Now, 50 years later, testing shows that compartmentalization offers protection in frontal & in rear crashes if the children are properly seated, but offers virtually no protection in rollovers or side impacts (1999 NTSB Special Investigation Report). Research by NHTSA indicates that lap-shoulder belts, in very vehicle they have ever been introduced, reduce injuries and fatalites by 45%. In the past, seat designs that included lap-shoulder belts reduced capacity and required a school district to purchase additional buses & reduce routes. However, the capacity issue has been solved! The SafeGuard FlexSeat® offers lap-shoulder seat belt protection and transports 3 elementary age children or 2 high school age children on a standard seat. No additional buses are required, and the fleet capacity is unchanged. In the past, some lap belts (note: different from the recommended lap-shoulder belts) were designed with a massive steel buckle threaded on a long web, making it possible to swing. However, SafeGuard lap-shoulder belts use a lightweight design with a retractable system. The buckle is attached to the seat with a short piece of webbing, making it nearly impossible to swing and use it as a weapon. Students are less likely to be injured in a bus accident if they are wearing a lap-shoulder seat belt. A properly restrained child who has not been injured can release himself and evacuate more quickly than an injured child. Buckles are designed to meet federal motor vehicle safety standards. They are thoroughly tested to unlatch with just the push of a button, even in the event of a rollover. From the moment they are born, children are conditioned to wear seat belts while in any kind of moving vehicle. Studies have shown that with proper and enforced policies in place, administered by the school district, seat belt usage rates can be very high. As with any other bus behavior policy, seat belt usage must be actively reinforced fro the safety of the children. The life of a school bus nowadays can be between 12 and 16 years. With SafeGuard belts on school buses, it’s only pennies per day. In addition to technological advances and volume increases that have lowered costs, SafeGuard belts have never been more affordable. Costs have been reduced by as much as 28% since 2003.